What does a mechatronics engineer do? Would you make a good mechatronics engineer? Take our career test to find out how you match with this and over 800 other careers. What is a Mechatronics Engineer? What is the workplace of a Mechatronics Engineer like? 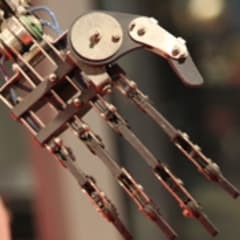 Mechatronics is a multidisciplinary field of science that integrates the principals of mechanical engineering, electronics, computer engineering, telecommunications engineering, systems engineering and control engineering into a unified discipline while keeping the core mechanical engineering education. In high demand, mechatronics engineers are uniquely equipped to work as mechanical engineers with electronics, instrumentation and real time software engineering skills. With a core mechanical engineering education and a strong background in integrating electronics, sensors and actuators into devices, mechatronics engineers are a valuable asset in a wide field of engineering. Mechatronics engineers work in all aspects of the development of products, from design and testing right through to manufacture. There is almost no product in the world that is solely electronic, electrical or mechanical in nature. With the growing capabilities of electronics, modern mechanical systems are embedded with electronics and controls. This means that the lines between each discipline are becoming increasingly blurred, and there is a growing demand for mechatronics engineers whose knowledge is strong across all of these areas. From consumer goods, such as microwaves, cars and smart phones, to industrial applications such as CNC machine tools, robots and MRI and X-Ray machines, mechatronics engineers use fundamental principles of electrical, mechanical, software, and control engineering in their design and development in order to generate a simpler, more economical and reliable way to do things. Mechatronics engineers create machines that are made up of several parts: the mechanical system, the sensing and actuation, the control systems and the software. An industrial robot is an excellent example of a mechatronics system; it includes aspects of electronics, mechanics, and computing to do its day-to-day job. Are you suited to be a mechatronics engineer? Mechatronics engineers have distinct personalities. They tend to be investigative individuals, which means they’re intellectual, introspective, and inquisitive. They are curious, methodical, rational, analytical, and logical. Some of them are also realistic, meaning they’re independent, stable, persistent, genuine, practical, and thrifty. Does this sound like you? Take our free career test to find out if becoming a mechatronics engineer is right for you. Mechatronics engineers work in industries such as robotics, aerospace, medical and assistive technology, mining or defence, material handling, human-machine interaction, manufacturing, unmanned aerial and ground vehicles, and education. They may work in laboratories, high tech companies, large global enterprises, processing plants or engineering offices but can also be involved with research in emerging fields like bioengineering, nanotechnology and robotics. Mechatronics engineers may be required to travel to present at a conference or view a new design idea or innovative technology.